Steven's campfire stories. An encounter with a pangolin on foot in Kruger. My wife has been pleading with me to write down some of my stories. To be honest, I really don’t consider myself much of a storyteller at all. And often I shy away from it. Especially when I’m put on the spot, like when people ask me “so what was your scariest moment?” Well, I’ll be honest: many! But to single out the worst is very difficult. For now, let’s just say I’m still in one piece. Another question people often ask me is: “What has been your best sighting?” To that, I reply “Seeing a sunrise and sunset in the wilderness every day.” I know, very typical, but when it comes to animals, it will have to be my pangolin. For as long as I can remember I have always wanted to see this elusive animal. I heard so many people talk about them and tell me of their sightings. Or mostly of someone they know that has seen one. Many of my colleagues in Kruger that have been here longer than I have, still have not even come close to seeing one. 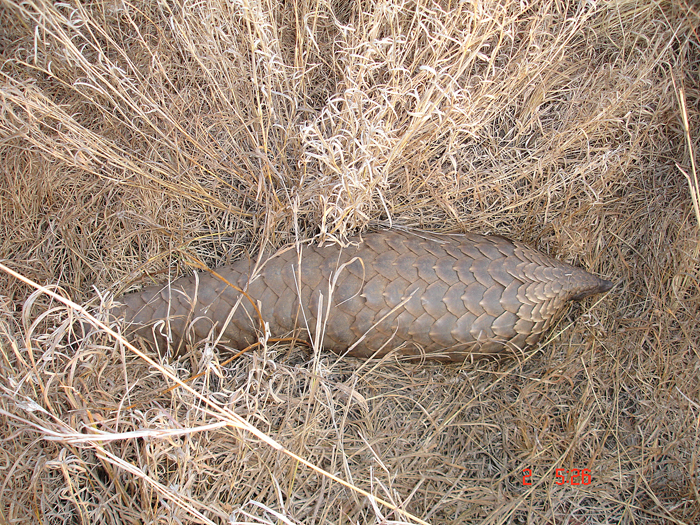 Once at Berg en Dal I did come close, but sadly that was a dead pangolin. Not much left of it but the hard triangular scales this animal is so well known for. Needless to say, I must have looked like a Looney to the guests. I stood there stroking the scales and murmuring to myself that one day I will see a live one. Especially because I had 4 Japanese ladies who could not speak a word of English on my vehicle. After a few years of guiding at Berg en Dal, Crocodile Bridge and Lower Sabie, I got a post at Metsi Metsi Trail east of Tshokwane. It was 2009 and one of the last few trails before we close in December. I was walking with Phillip, an absolute legend and we decided to walk from camp north towards the Lindanda plains. Not far from camp, we found two old buffalo bulls known as daga boys because of their love for mud wallowing in their retired years. While we looked at them and they looked at us like only daga boys can, something moved in the long grass to my right. I asked Phillip what that was. He immediately assumed it was a honey badger and put his rifle between his legs. This is a good reaction for this kind of ferocious animal, but it did look comical seeing a big man stand like that. I put the rifle there as a reference for the pangolins size! I was so excited to finally see a pangolin that I must have looked like Michael Jackson on a hot bed of coals. And I really can’t dance. Thinking about it now, the guests must have thought the worst. We were no longer worried at all by the buffalos. And suddenly their trails ranger was jumping around. Getting a good look at my pangolin. I called them over and shouted pangolin! About a hundred times I suppose. Phillips face lit up. Of all his years in Kruger, he has also only seen this animal twice. The Buffaloes just stood there chewing the cud and staring at us. I was immediately trying to explain to my now very confused trailists just how special this was and very soon they realized and joined in on the excitement. I could not get enough of the pangolin! Graciously he did not roll up in a ball at first but stayed stretched out flat on the ground so I could see his face up close; the small snout and tiny dark eyes and the incredible hard scales that become perfect miniatures all the way down its face. Happiest ranger on the planet! This really was a dream come true, and Phillip was having a great laugh at my excitement. After a while, in slow motion, the pangolin started to roll into a ball. His head pressed to his belly and the amazing tail hard as armour covering the back. He rolled into a perfect ball the size of a basketball. What a creature! And it just lay there completely still. I looked up at the guests and said I have to kiss it. After probably an hour with the pangolin and many photographs we left it and carried on north. The Buffaloes were now lying down and chewing the cud. I kept looking back hoping I had made a friend and the pangolin would follow us. But I’m sure he slowly unrolled, looked around cautiously and carried on to find a place to hide for the day. Well, that was my first campfire story. I hope you enjoyed it! A lot of readers have already voted for Linda’s blog. If you have not voted yet, can I kindly ask you to do so by clicking on the SA Blog Awards Vote icon? Thank you!! Until we meet around the fire again! Best regards, Steve. Great story Steven, please continue , you do this well! I have been going to the park yearly for the last 30 years and have only once seen a Pangolin, very briefly, I understand your excitement . Great story Steven, looking forward to the next one. Keep safe out there . Having never seen a pangolin I can just feel your excitement. We keep a lookout every year and I think I shall probably have a heart attack if we ever do see one! Wonderful start to your camp-fire stories and thanks for agreeing to tell them; look forward to the next one. Thank you Steven, for sharing this wonderful experience of yours. Your face says it all! Hi Steven, thank you for sharing this lovely story. It is not about the large glamourous animals but of a very special small animal. I loved your statement about appreciating the sun rising over the African bush. Please keep your stories coming together with that of Linda. Great story Steven! Loved it! I would also be jumping up and down for joy! I am still hoping for my first Pangolin sighting! Looking forward to meeting you at some point! If that is Steven NOT being able to tell a story I look forward to him hitting his stride. That was a most engaging narrative – very personal and your excitement and wonder come through strength ten. Keep them coming both of you! So enjoyed this. We did the Metsi Metsi walking trail many years ago. Still one of my best experiences I. Kruger. Looking forward to more campfire stories. Some fantastic stories here Linda, an awesome blog, one of the best I have read. Keep writing smurf! Oh, and tell me I’m not right. Looking forward to reading much more. Will tell Steve you said hi. He is on his way to PTA for his exam. Love to Pam, see you guys soon hopefully! Oh Wow! what an amazing retelling of what must surely be the sighting of a lifetime. To be able to see one on foot never mind from the safety of your vehicle is so very Special. I can see you jumping around in my minds eye and can only imagine what your guests must have thought at first. I eagerly await your next campfire story Steven. If this first one is anything to go by the rest are sure to be just as entertaining. Awesome – natural story teller. For someone who says he is not much of a storyteller , that was wonderful ! Thank you and please keep going . Looking forward to many more . You are very humble Steven – you are a brilliant story teller ! I loved this first blog about the Pangolin. I am 80 years old and loved the bush all my life and this year I saw my first Pangolin at night in the Sabi Sands so I can relate with your excitement at seeing this beautiful animal in the wild. Looking forward to your next blog. So great to read your wonderful and exciting tales of Kruger. So great to read and written in such wonderful words. May you have a wonderful Xmas with your family. Thank you Steven …. now we have more wonderful Kruger stories to read.